The Performance Measures KPI for investment portfolios is a way to track how the value of your investments is responding to changes in the market, and how the value of your investments changes over time. The market can be volatile, and in order to maximize your investments, you need complete, up-to-date visibility over stock trends and the direction the market is headed – allowing you to allocate or withdraw investments swiftly as needed. This KPI incorporates a broad range of metrics, including total assets, your number of clients (and assets per client), earnings per share, market capitalization, percent change in performance, and highs / lows over a set timeframe. Brought together, these allow you to swiftly visualize the overall performance of your portfolio, so that you can monitor its trajectory and respond fast. What Data Sources Would You Use to Measure the KPI? Data is typically drawn from current and historical price information, and client details stored in your CRM. Let’s say you get a panicked call from a client, concerned that shares in one of their investments has taken an unexpected blow. 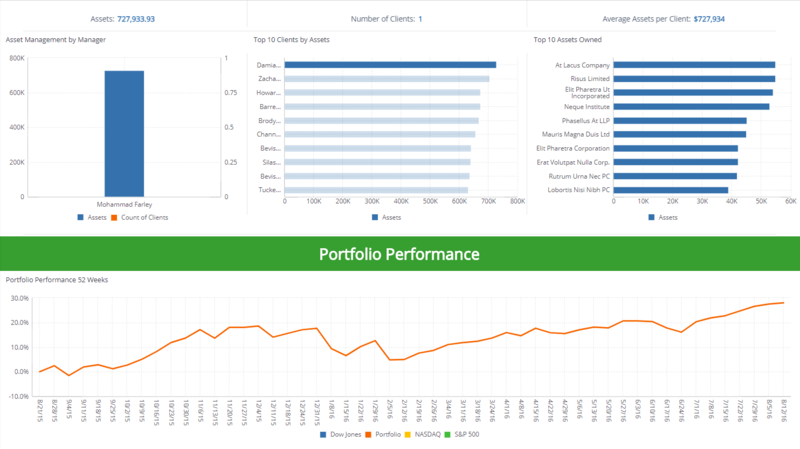 By consulting your portfolio performance over the past 52 week period, you can swiftly assess whether this dip fits with a broader pattern and reassure them that it will likely recuperate, or alternatively, whether it’s part of a larger decline - in which can it might be wise to reallocate your investment. What Benchmark / Indicators Should I Use? Obviously, you want your overall performance to go up! Within this, that means increasing your market capitalization, as well as the size and value of assets under your control.